So, you might have noticed, but we're pretty into Halloween here. It is kind of our gig! But, we don't want you to think we don't care about the other holidays. Not for one second! We most certainly hold other important holidays in high regard, particularly if we're able to mix in some costume fun. One of the most things to do at Christmastime is to dress up in ugly sweaters, and when you need a pair of socks to match your sweater, we've got just the thing. These Naughty Nice Knit Christmas Slipper Socks! 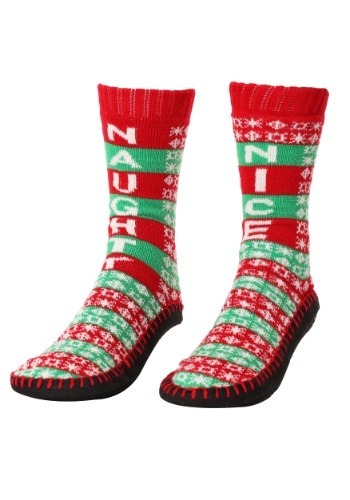 These Naughty Nice Knit Christmas Slipper Socks are 60% acrylic and 40% polyester. Knit stocking slippers with anti-skid fabric soles, they have "Naughty" & "Nice" knit down front for the perfect touch of ugly! The decorative blanket stitch around the top of soles adds a nice touch, too, so you can wear them anytime you need an extra layer on your feet. We, of course, recommend wearing them during the holiday season! We do, in fact, carry all things costume in our catalog, and fortunately for you, that includes ugly sweaters, too! 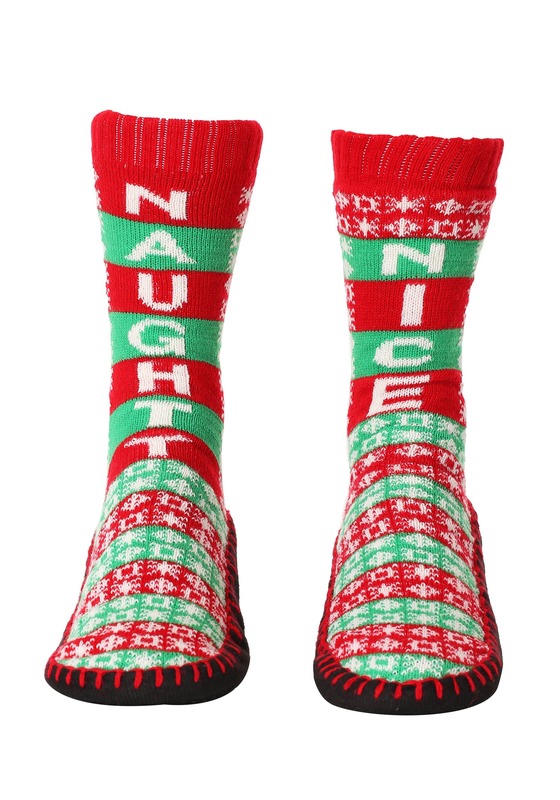 Check out our entire selection of holiday-themed apparel to go with this pair of socks. From sweaters to Santa suits, we've got you covered!